A 40-year-old man broke his back and had serious injuries while jumping off Fawn Leap Waterfall around 2:30 pm on Sunday June 17, 2012. He was transported to Albany Medical Center in Albany New York by Helicopter. It is our understanding that he was unconscious with a broken back and other serious injuries. His identification and the specific details of his injuries are not being released to the public. Police speculate that he was jumping off the waterfalls, and did not accidentally fall off the waterfalls. Fawn's Leap Waterfalls is located about 150' west of Moore's Bridge and is right next to Rt 23a. It is located in the Kaaterskill Clove between Bastion Falls and Palenville. It is located in the Town of Hunter. You cannot see the actual waterfall from Rt 23a. Fawn's Leap is 24' high and has a clear jump into the pool below. But, if you slip while crossing Kaaterskill Creek, you can fall onto a bump in the falls, which can seriously injury you or even kill you. 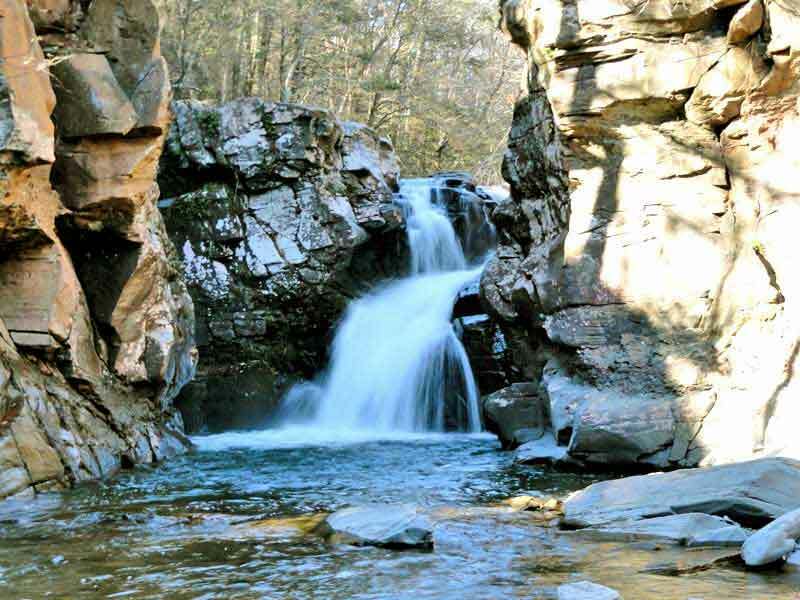 Most people jump off the falls to the LEFT of the waterfalls - BUT, you must cross Kaaterskill Creek to get there. I used to partake in an occasional leap off of "Fawns Leap". Some of my buddies would jump maybe a dozen times in any given day...Can't say I jumped that much, but the danger in this area is under rated. As the above post indicates the crossing of Kaaterskill Creek can be VERY slippery. Regardless of the CFS. 40 years old and still cliff jumping? Well that is something else. Can't say I've taken a leap of faith like jumping off of "Fawns Leap" in a while. Not my thing. On the way to a hike last week my father and I drove past two young guys, while ascending the clove on 23a, they were shirtless and had dripping wet bathing suits, evidently just walking back to their illegally parked truck, after "jumping". This was at 7:00am. Our windshield thermometer read 60 degrees F. I shivered as I looked upon these people and took another sip of warm coffee to keep the goose bumps at bay. To my understanding Plattes Clove and the Devils Kitchen is also a big "cliff jumping" destination. I once walked through the aforementioned clove and had a hard enough time not slipping on the algae covered rocks, while wearing vibram soled hiking shoes. To endeavor to stand atop a large cliff in this area and then jump into a plunge pool is tempting fate, if you ask me. I suppose the seconds of falling thrill can stay away boredom, but at what cost? A broken back? Spine? Paralysis of limbs? etc etc. Post Script- I hope for a speedy recovery for this fellow. All lamentation aside. On another note, it was cool to see a sneak peak? of the new waterfall section of the site. Is this formally released yet and if not, is there a target? 1. Mike and Rich have to get into Buttermilk #5 and #6 to photograph and measure them. Both of them have made several attempts to get in. These are the two big ones. As some people already know, Buttermilk Falls will become the highest waterfall in NYS once they are done at 549'. The Five Cascades will become the 2nd highest in NYS (somewhere around ~400' I think). Then it will be registered in the waterfall database. Needless to say, Buttermilk Falls are dangerous, and the Five Cascades are ridiculously dangerous. It is also possible that Lucas Kill Falls might fall somewhere in this range also. Only part of the Lucas Kill Falls have been done. There is also another waterfall over in the Winter Clove that might rank up there also, but it is a very small body of water. 2. The Waterfall Safety Hiking section has to be completed. Normal rules of hiking don't apply to waterfalls. We want to make sure that people are not harmed due to poor safety measures. 3. They have to clean up the pages, and add some missing waterfall information. There are also some more waterfalls in the Winter Clove which haven't been documented. 4. The MTHS is also going to create names for some of the newly discovered falls. Or, find old historical names if they can find them. But, this will not stop it from being published. It has been a long road to get the waterfalls section up. Rich and I will be getting together soon to get some of these waterfalls checked off the list. The safety section will be important. Lots of hidden dangers. Even for experienced hikers. Yeah Sam...that water is VERY cold! If it is 90 degrees out then the cold water feels good. But, not when it's 60 degrees. They can park next to Fawn's Leap or below there because it's in Palenville. But, as soon as you go around the corner, then it's in the Town of Hunter. Then you'll get a ticket. Thanks so much for the update regarding the waterfall section of the website. Your comments about the Five Cascades being "ridiculously dangerous" are "dead-on" correct. I can personally vouch for that. Back in the fall of 2009, I hiked to the base of the Five Cascades after a heavy rain and took the photo below. My full "adventure" is posted in the "Hiking" section of the website for anyone who cares to read it. The hike was much more grueling and dangerous than I imagined. The surfaces of most rocks were as slippery as ice and the near vertical landscape near the base of the falls made any kind of exploration exceedingly difficult. In the photo below, you can see all 5 falls, plus Shelving Rock. Tritan Cave is out of sight to the left. I somehow made it up to the top of the ledge by Shelving Rock, but quickly discarded any idea of walking out on it (in spite of photos taken in the 1800's showing photographers with their tripod set up on the rock). Shelving Rock slopes down towards the falls and the surface has a bright shine, implying a very slippery surface. My photo below is a bit deceiving since I used a wide angle lens to capture all 5 falls. The wide angle lens compressed the height, making the falls look much "flatter" than they really are. In reality, they are appoximately 400 feet high from the base to the summit. I am hoping to join Mike and resume our exploration of Buttermilk Falls as soon as things settle down at work. Mike and I are also "pondering" a hike to the base of the Five Cascades. If anyone decides to try for the Five Cascades, I cannot implore you enough NOT to go alone! And also, please remember to bring a FULL change of clothes if you explore any waterfalls. You will likely be soaked to the skin by the time you get back to your car! Rich is right. Climbing the Five Cascades is ridiculously dangerous with or without ropes. the Five Cascades are also on Private Land, and the owner will not allow people to climb it due to a death & lawsuit years ago. If caught climbing it, you will be arrested. BUT, you can hike to the base and view the beauty of the Falls. State land does come up towards the base of the Falls. Back in the Hotel days (1800's), they had walkways and ladders, which made it safer, but still quite dangerous. Also the base of Haines Falls used to accessible back in the 1800's, but that path has been washed away. Now, there is a 50' cliff where the path used to go. Haines Falls is also on private land. You can't get permission to go there. They are very sensitive to hiking in this region. We do have great pictures on-line if people want to see what they look like without going there. There is another post of this angry little mink here . Lots of pictures too!